Renovations can add serious dollars to your final selling price, but before you invest your time and money, do your research and use your renovation coin wisely. We’ve compiled our top ten do’s and dont’s for renovating properties to help you get started. One thing that is vital to do before you commence a renovation -check with your insurance provider whether you are covered by public liability and home and contents insurance during works. If you have to vacate the property during renovations, your policy may lapse after a certain number of days of unoccupancy. Your builder/contractor should be licensed and have insurance to protect them and their employees against any claims made against their work and their employees should be covered by worker’s insurance. Have you ever heard someone walk into a property and complain that it is too spacious? Of course not! A property may be overly large for a person’s needs, but a sense of spaciousness that works with the proportions of a house will always be a winner. Creating space doesn’t have to come at a premium cost. Simple tricks like removing bulky furniture and painting walls in neutral colours will get you started in the right direction. Again, people rarely complain that a house isn’t ‘dark enough’ inside. Buyers want light – preferably natural light. Think about opening up a non-supporting wall or adding bi-fold glass doors to give your living areas a natural, modern feel. Reliable tradies turn up when they are supposed to, get the job done and stay within the budget they’ve quoted. If you find a good one, make sure you look after them and keep them happy. Be clear what it is you expect them to do and pay them on time. You’ve nailed down the design and sourced good, reliable tradies: now it’s time to stick to your original budget. Of course, there may be unpleasant surprises in the form of serious building issues – it is wise to have a contingency plan in place to cover the unexpected. Expensive flourishes or design changes that were not in the original scope of the job can be costly. The last thing you want is to overcapitalise when you renovate. Choose your builder/project manager carefully – make sure they have the same vision as you and then stick to that agreed vision. 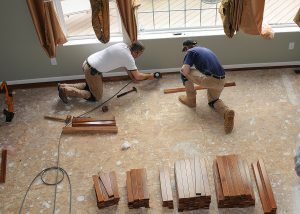 The most expensive, time-consuming activities when renovating are due to last minute changes. Try not to give in to the urge of changing your mind unless it adds serious value or is required to maintain building integrity. Your builder and tradies are not mind readers, so providing them with a plan will make your vision clear and provide a working schedule. It’s important to have a design on paper and make it accessible to everyone involved in the building project. Detailed, professional drawings give your vision a better chance of coming to life, and act as insurance against unapproved design changes. Are your renovations are in keeping with the style of the home? There’s no point putting a state of the art wetroom in a circa 1890’s cottage, just as there’s little point in a French provincial kitchen in a sleek, city penthouse. Sympathetic renovations add to the fundamental character and appeal of a property, and that means added value when you decide to sell. Every time you stop and talk to the workers on your building site, especially if it’s about their weekend or the footy, you’re losing money. Most tradies are paid by the hour, and every time one of them stops, the entire schedule slips. Constant interruptions by the homeowner can end up costing many hours in downtime on a site. There will be times when problems arise that have to be dealt with on the spot, but a good rule of thumb is to set ten minutes aside each day (preferably first thing in the morning) to speak to the foreman and iron out pressing issues. Be friendly and welcoming by all means, but make sure you run a tight ship and you’ll reap the rewards.